Today has been a bill, laundry, and cleaning day so I haven't done much in my craft room. I thought I would share some pictures with you of my craft room. My craft room is the last room in my house to get cleaned. It is usually not to bad but I have had so many projects and been out of town so many times the last couple of months that it has been neglected. I had to run to the bank today and "sadly" (LOL) it is right by my Hobby Lobby. I usually avoid the temptation to go but I had just talked to Robyn who had told me that the paper packs were on sale. I found some cute packs! I already have some ideas of what projects I want to use them on. You habe LOTS of Hobby Lobby bags. It's not your fault that Hobby Lobby is on the way...now is it? Oooo those look like they will be a lot of fun. I cant wait to see what kinds of things you make with them. Love the papers and cannot wait to see what you make with them! Your room looks great to me. I wish we had HL here in the Pac. NW. Nice paper finds. I love your paper holders. I need some. I love paper. I hit up Hobby Lobby today too...as a treat after a blah dr's appt. Oh dear, I love that store. I was good and only got 2 paper packs...one of the Christmas ones you got. My hubby loved that one too. I hope you have a great day and that your fil is doing much better. WOW! you have tons of storage, it looks great, Im in the midst of doing my craft room and you gave me some great ideas, thanks! Have a great holiday weeekend! Wow!! I want some of those too!! :) Karlee, I can't wait to see the project from these stacks. i did too bought some more papers and a few things for the house...all 50% off. isn't great? yay! Your room doesn't look to worst for wear. And by all means, gotta hit Hobby Lobby when you can. The closest Hobby Lobby to me is about 35 miles away, not to tempting. But there is a Michaels about 12 miles away, so I hit there a bit more often. Anyway, have a great day. Hello, it's a sale.LOL I went to JoAnn & Michaels too! OOOOH.. Karlee I can't wait to see the projects you will make with your new papers. I really need to go for a trip down to the states to get me some good deals on craft stuff. I find even with the dollar exchange everytime I go to Seatle or Walmart between Bellingham and Seatle its WAAAAAAAAY cheaper than here. Gotta check to see where that Hobby Lobby is in WA. Nice to see I'm not the only one whos craft room is perfectly unperfect'!! Karlee - I don't know how you could not go into Hobby Lobby - I think I would have to find a new bank! Can you let us know where you got your shelves/crates that are under your desk - they look wonderful. I am having my first grandbaby so if you find any thing baby you dont want let me know. hehe. Wow! I wish there was a HL close to my bank...but on the other hand I go broke! I only get to HL once a year so I always look forward to that! Those paper pads look very intriguing! wow girl look at those HL bags..lol love you craft room!! cant wait to see what you come up with using your new paper! 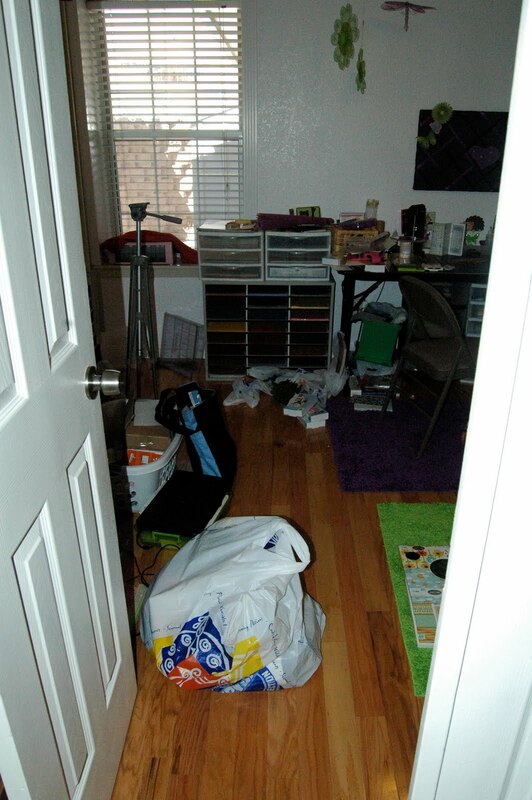 I love when people show there craft rooms ~ I work in a corner in my dining room! You have a ton of paper storage~ so jealous! Hey one of the best things is that it has a DOOR! Lol. I would love to have one so I can just shut it when I am done. Looks fine to me! LOL!! Don't blame those paper packs on me! You LOVE to buy paper packs! Although, a few of those that you bought I didn't pick up so....... maybe I need to make another trip!! Oh how fun! Cant wait to see what projects u make with those new paper packs!! I am in need of paper storage for my paperaholic addiction :)) Where did you get your paper storage shelves???? I don't think you can ever have too much paper:) Can't wait to see what you create. My Craft room is the last room to be cleaned as well. I know my husband probably cringes every time he comes and finds me in the middle of the mess. But I call it creative thinking spot. LOL. Have a great day weekend! Don't worry, I plan on going to Hobby Lobby tomorrow to stock up on paper, too. You can't help it if it's right there! Wish Hobby Lobby was not an hour away. They have some of the best deals. Thanks for sharing pics of your room. Hi Karlee you have a fab craft room and sooooo much craft things lol! You have inspired me into buying a Bind It All...can't wait to get my hands on it! Off to a stamp and scrapbooking show the end of this month so it is top of my list. Keep up the good work of inspiring us all. Awesome Space... I was wondering what yours looked like after seeing you help Robyn. Karlee, I can't resist temptation either. Do you think we need a 12 step program?